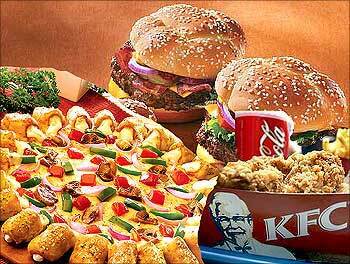 Inspired by the world famous McDonalds, Kentucky Fried Chicken, and Pizza Hut, Lucknow's 105-year old Tunday kababs has turned corporate. Having acquired a trade mark that was launched in Lucknow on Monday, Tunday Kababi Pvt Ltd has decided to give away its franchisee not only within India, but also across the globe. Sure enough this was a big stride for one who had made a humble beginning from a ramshackle 'kabab-paratha' shop in a narrow bylane of Akbari Gate area in Lucknow's walled city, way back in 1905. The new venture's founder chairman Mohammad Usman announced on Monday, "The first franchisee has been awarded to M/s US Eating Point, a modern restaurant set up at a strategic location on the main picnic spot road in Lucknow's Khurram Nagar." 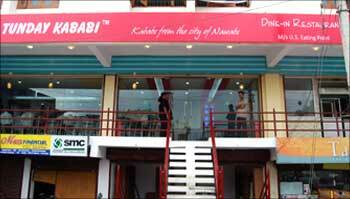 Image: The new Tunday Kababi. Usman's next destination is Bangalore, where his friend Abdul Rehman Khan has already sought a franchisee arrangement. Rehman, who was in Lucknow to attend the franchisee launch, said, "We have received tremendous response to the initial feelers that we sent in the market and I can assure you that Tunday-Bangalore will be a blast." It was only after keeping themselves confined to a remote corner in old Lucknow for nine long decades that Usman persuaded his father Haji Rais Ahmad to move out and start a parallel outlet in Aminabad in 1996. And once again it is Usman, who has taken the initiative to give his late grandfather Haji Murad Ali's modest local venture a corporate identity. Ironically, it was Haji Murad Ali's handicap - an amputated arm - that gave 'Tunday' its name that has thrived through generations. Image: New Tunday's founder chairman Mohammad Usman. It was another matter when Usman entered into short-term arrangements with personalities like Jiggs Kalra to offer Tunday kababs at food festivals in Singapore or at the Taj and Radisson hotels in India. 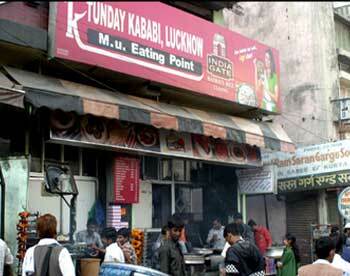 "That is what gave me the initial idea to take Tunday beyond Lucknow. "In order to give a brand identity to our products, we wish to standardise the ingredients in the same manner as McDonalds or other well known brands do," Usman pointed out. "We will ensure the same quality and standard of food at every franchise," he added. Asked how he proposed to achieve that in the absence of an infrastructure that McDonalds or other multi-nationals have, Usman explained, "Well, the nearly 100 condiments and other ingredients that go with the meat will be supplied by us from here and to begin with, I will personally visit each of the franchises to see that the standard and quality is strictly adhered to." No wonder, Usman made it a point to himself supervise the preparation of kababs at the first franchisee -US Eating Point in Lucknow on Monday. US Eating Point was started by two young NRI's Uzair and Shakil , who decided to say good-bye to their respective businesses in Sharjah and return to their roots. "And when we thought of paying back to our homeland, we could not think of anything better than taking the Tunday name ahead," remarked Uzair. "I am sure US Eating Point would be a hit," predicts Usman, who is confident of going far with his plans to open franchisees not only across India but even abroad, particularly countries where his melt-in-the-mouth 'galavati kababs' are already in great demand by the non-resident Indians. Image: The old Tunday joint. Satyam's Raju & the 108 business plan! Fake notes: India's secret template compromised!